The reports I discussed yesterday regarding Hillary Clinton using private email as Secretary of State are leading some, such as Frank Rich, to wonder if Democrats need a backup plan for 2016. A follow up story in The New York Times reports how Clinton used her private email to thwart requests for information, including requests from Congress and Freedom of Information requests from journalists. These ethical breaches by Hillary Clinton are of particular concern taking place so soon after scandals in the Bush administration regarding private use of email, making many liberals besides myself question why Clinton could have done something so foolish. It leaves Clinton vulnerable to at least three lines of criticism: that she potentially broke fundamental rules governing the handling and security of state secrets; that she skirted around guidelines put in place to ensure historical accountability and transparency within high public office; and the political attack that she must have had something to hide. The unusual practice of a Cabinet-level official running her own email server would have given Clinton — who is expected to run for president in the 2016 campaign — significant control over limiting access to her message archives. The AP said Wednesday it was considering taking legal action against the State Department for failing to turn over some emails covering Clinton’s tenure as the nation’s top diplomat after waiting more than one year. The department has failed to meet several self-imposed deadlines but has never suggested that it doesn’t possess all Clinton’s emails. There’s no shortage of problematic angles to this. Obviously, there’s the question of transparency and compliance with the Federal Records Act. 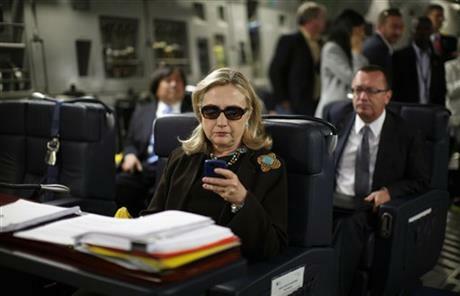 Clinton wasn’t the first Secretary of State to make use of a personal email account – Colin Powell did the same thing during his tenure in the Bush/Cheney administration – but preservation rules have changed and Clinton apparently faced more stringent requirements. There’s also the matter of security: as Secretary of State, Clinton sent and received highly sensitive information on a daily basis, including classified materials, from officials around the world. By relying on private email, instead of an encrypted State Department account, Clinton may have created a security risk. Other liberal bloggers have been far harder on Clinton. Clinton is also receiving criticism on MSNBC, as opposed to the partisan defense we would expect in the reverse situation from Fox. Needless to say, conservatives tended to be quite critical, and hypocritical, usually ignoring the comparable use of private email by many Republicans, including officials in the Bush administration, Chris Christie, and Sarah Palin. It was disappointing but not surprising to see that the Clintonistas did quickly get some writers out to defend Clinton. Typically their defenses were no more honest than a report from Fox. Defenses of Clinton tended to concentrate on the arguing that Clinton did not actually break the law. This is definitely a case of moving the goal posts and possibly also incorrect. The initial articles raising these concerns did note that Clinton may have broken the law and with the complexity of the regulations involved avoided a definite conclusion, but it was her conduct and judgment, not whether she was in violation of the law, which is the heart of the issue. The defenses of Clinton point out that Colin Powell used private email, but ignore the changes in regulations made in 2009 which “required that all emails be preserved as part of an agency’s record-keeping system.” Her defenders have also ignored the more stringent requirements put into place in 2011. As a consequence of these rules changes, John Kerry has used government email for his communications, as has Barack Obama since taking office in 2009. Many of the other defenses of Clinton are rather trivial attacks on the journalist who wrote the story. The statements that these revelations came out as part of the Benghazi hearings is contradicted with finding a journalist who had reported on this previously. This is analogous to the debates as to who discovered America. Finding that someone had previously reported on Clinton’s private email does not change the substance of this story any more than discovering that Vikings beat Columbus to America substantially other facts regarding American history post-Columbus. The rapid release of such dishonest defenses of Clinton by her allies is yet another reason why I would hate to see Hillary Clinton as president. I have always been disturbed by the degree of secrecy when she was working on health care reform, her push for war against Iraq based upon fictitious claims of ties between Saddam and al Qaeda, along with many questionable statements I’ve heard from her over the years. Electing Clinton would be a great blow to honesty and transparency in government. Democrats should be able to do better. There is no question that Clinton was at least skirting the rules in effect when she became Secretary of State, if not outright breaking them. Her honesty has already been a serious question. Someone with a reputation for dishonesty and lack of transparency should have realized that this would only make matters worse. Her credibility, already in question, will be even lower when there is always the question of secret emails looming. Republicans will be able to drag out their hearings on Benghazi even longer because of this. If she runs against Jeb Bush she would be on the defensive over transparency after the release of his emails. Clinton has never been a very good campaigner, and her lack of judgment in this matter only raise. « Did Hillary Clinton Learn Anything During All Her Years In Politics?